Berkeley, CA â€“ 16 June 2011 â€“ The trials and dangers that occur within the borders of Afghanistan seem like a world away to most western comic readers, but the new Image Comics miniseries GRAVEYARD OF EMPIRES has immediately hit home with fans and critics. In fact, this first issue by former GROUNDED co-creators, writer Mark Sable and artist Paul Azaceta, has sold out at distribution level, prompting the publisher to go back to press in order to meet the high demand. 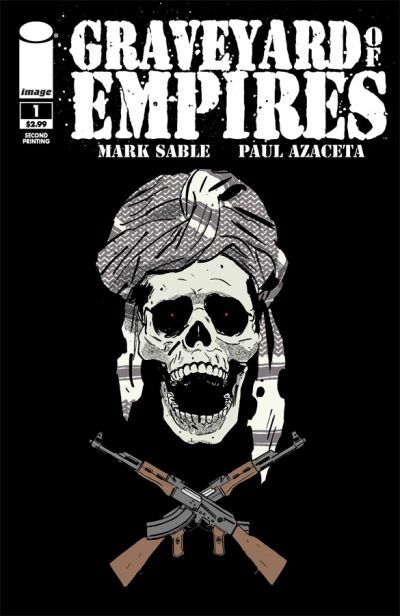 GRAVEYARD OF EMPIRES offers a daring story mixing very real portrayals of the horrors of war with more traditional horror elements, all rendered with the expert restraint of Azaceta’s ink. This first issue is packed with story pages and Sable uses them all to let his characters inhabit their dangerous world and develop before the reader’s eye. The two have set forth to illustrate just what “insurgent math” means on the front line of GRAVEYARD OF EMPIRES, and so far it isn’t pretty. The second printing of GRAVEYARD OF EMPIRES #1 (MAY118033), a 32-page full color horror/survival comic book that will appeal to fans of The Hurt Locker and THE WALKING DEAD, is priced at $2.99 and available for re-order now with an in-store date of July 13, coinciding with the release of GRAVEYARD OF EMPIRES #2 (MAY110509).